When Is It Braun Strowman's WWE Turn? Braun Strowman is what professional wrestling heel could never have been in the 1970s and early 1980s. He is big, powerful, has a cult-like following. Most of all, he is the most popular character on the company’s top brand, Monday Night Raw. In a business that used to be protected by Kayfabe, Strowman was have been the hated villain, facing every babyface that came along. Fans would have cursed him, thrown things at him and feared him with his massive size and strength. Today, he lines the McMahon family pockets with green paper and gets some of the biggest pops from the crowds at house shows and live events. Strowman, even as the gargantuan heel he is portrayed to be, is the biggest babyface WWE has today. The company that took a mid-level performer and transformed him into a mega success now must decide when is the right time to push the button that will ascend the fairly green wrestler toward the apex of the company’s food chain. Strowman is the future of WWE, bidding his time until Brock Lesnar leaves the business and Roman Reigns fails as the pet project of Vince McMahon’s fertile mind. In most cases, patience is a virtue. In professional wrestling it could be the kiss of death. The “Monster Among Men” has the same kind of appeal as Steve Austin, The Rock, Undertaker and other big men of the Attitude Era. 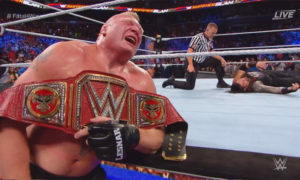 The problem that exists is the McMahons have remained loyal to Lesnar’s “run amuck” mentality and Reigns’ look of a champion and appeal of a wet paper bag. How WWE plans to book the man who began his WWE career as a member of Bray Wyatt’s family will determine his staying power and whether he headline’s WrestleMania 35 in 2019. As Mike Mooneyham wrote this week, “It’s all but etched in stone that Brock Lesnar will be headlining Wrestlemania 34 against Roman Reigns. It’s the event at which Vince McMahon has decreed that the self-proclaimed “Big Dog” will reign supreme and be handed the keys to the kingdom. 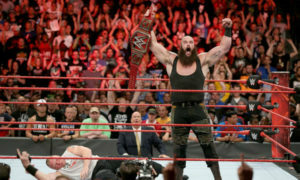 If you ask wrestling fans their feelings about the current state of Monday Night Raw and the Universal Title, it’s no secret there is a “pro-Strowman” faction larger than his appetite of destruction. Reigns is the hand-picked champion in the same vain as Hulk Hogan and John Cena before him. The difference is their charisma and commercial appeal made them larger than life. You cannot argue Reigns is one of the company’s five best performers and if not for the inability to capture the audience’s attention for more than a minute, he could be booked as the best of a good lot of performers. It was suggested that WWE should get over the school girl crush with Reigns, move on, select a new beau to call their own. In fact as some wrestling fans have pointed out, the wrestling would could turn on its ear with a few changes at Elimination Chamber. It’s a move I have called for in the past. Would WWE act on it? Probably not. The Attitude Era and Ruthless Aggressive were the last time the leader of professional wrestling had the stones to pull off such a change. Strowman is waiting in the wings, as Mooneyham and myself and others have advocated for. The plans are set. The mission will be accomplished. Professional wrestling has a history of missing out on directional change fans prayed for. Arn Anderson was never an NWA World Champion. Roddy Piper never carried the brass ring. Strowman has a chance to be bigger than both of them. In due time. My biggest fear is WWE waits too long to make all of this happen. It’s a lesson the company hasn’t learned yet. Strowman’s popularity should be capitalized upon before another “big thing” comes along. Missing out on his potential dominance for years to come could be the biggest mistake WWE makes in quite some time.